Thursday, May 24, 2012: They say it takes five million steps to hike the whole Appalachian Trail. If so, then I took my five millionth step today. That's 2184.2 official trail miles hiked this year. Of course, I haven't hiked the whole trail - just half of it. But since I retrace my steps every day, I've now hiked the equivalent of the entire trail. Half way in less than five months. That's pretty good. I now have more than seven months to do the other half - so let's get on with it. No lingering celebrations today. No parties. Just a renewed determination to make it all the way. I parked at NY 22 near the Appalachian Trail Metro Station again and was on the trail at 6:50AM to hike a 3.5 mile leg north. In the past I have always loved the meadow and pasture walks. This morning’s hike started out with a mile of that, but I hated it because the grass in the successive fields kept getting higher and higher until it was nearly waist high. And of course it was all soaking wet. At first, in the lower grass, I was having reasonable success keeping my feet dry, but across the final field of waist-high grass that was impossible, so all the care and energy I spent keeping my feet dry was wasted, and that’s what really bothered me – the pointlessness of all my effort. The most interesting part of this section was this Jules Verne Rocket Ship waiting to launch from a grassy hillside. 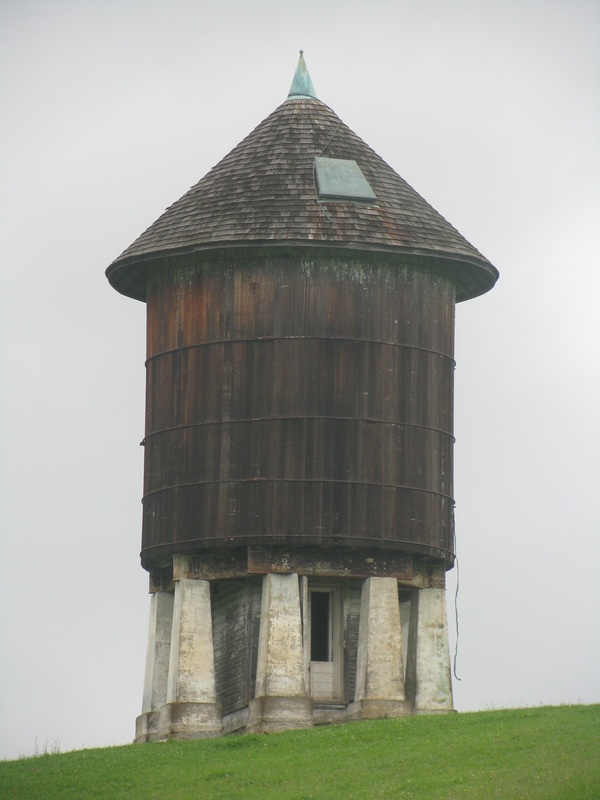 It's actually a 1920's water tower built by a local dairy business that has long ago vanished. 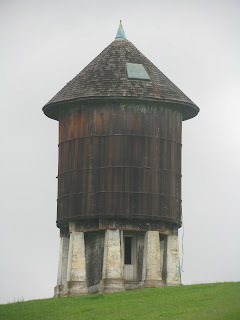 Only the sturdy water tower remains to mark its location. At the end of the mile of field walking, the trail enters Pauling Nature Reserve, owned by the Nature Conservancy if I interpreted the sign correctly. There was a trail register there, which I signed, and I used the removable drawer in the register box as a dry seat – sat down and changed my socks, putting on cotton socks to try to absorb as much of the shoe moisture as possible before later putting on a regular pair of hiking socks. In the nature reserve the trail begins to climb Hammersly Ridge and then begins to pass a series of side trails along the ridge top. First there was a red trail that crossed the AT and went both east and west, then after about half a mile there's a yellow trail. Beyond the yellow junction the AT begins a series of sharp little rocky ups and downs - no more than 20 feet elevation change with each of them, but the come one after another in quick succession, so it feels like a roller coaster. When that ends, the AT gets on a long stretch of puncheon and right near the start of that there is a ‘puncheon junction’ with the same red trail headed back on the west side (left). That was quickly followed by a green trail to the left and then a red trail (or the same one) departing to the right. Then, after almost a mile there’s a yellow trail, near the northern end of the Pauling Nature Reserve, which goes right (east). I turned around there after changing into my third pair of socks and headed back, passing one guy who looked like a thru-hiker and an older couple clearly out for a short day hike. I got back to the parking area at 10:45 and spent the next two hours off the trail, changing into dry shoes and socks and driving to my next parking area with a fairly long stop to replenish the ice in my cooler. Then I found my next parking area at Hoyt Road where there is a nice little square parking area off the road to the east, right where the AT leaves the road going northbound after a short road walk. I finished my preparations and was back on the trail at 12:45, headed back south. The trail crosses a few overgrown fields and climbs a bit then begins to descend through woods in a twisting route that finally comes to a big stream called Duell Hollow Brook. After crossing it on a fairly elaborate footbridge composed of two spans well above the water, the trail ascends to cross Duell Hollow Road and then ascends fairly steeply to the Wiley Shelter. There’s a hand pump below the shelter a few hundred yards, but a sign taped to it said ‘out of order’. The trail comes right up to the shelter and then makes a sharp left turn right in front of it and continues up to the high ground. Wiley Shelter has sagging fiberboard floors – didn’t look very comfortable. I got out the register and was starting to read it when a hiker came down (from the south) and sat down at the picnic table with me. I was reading the register and trying to talk with him at the same time - telling him that the pump was out of order but that there was a small stream running across the trail right in the same area, when the last register entry caught my eye. It was ‘Meats’! He had signed the register today. Well, the guy I was talking with turns out to be a thru-hiker also, named ‘Salty’, and he had met ‘Meats’ back in Duncannon but had been behind him since then after taking two zero days. He said he saw Meats’ entry in the Telephone Pioneers Shelter – he had apparently stayed there last night. That means that Meats had to have passed me today somewhere. But even with my two hours off the trail, I picked up the trail seven miles further ahead, so it seems unlikely that Meats covered those seven miles in two hours. Did he get a super-early start, such that he had already hiked the 3 miles from Tel Pioneer Shelter to NY 22 before I hit the trail there at 6:50? It’s certainly possible, since the sun rises at 5:30. Anyhow, I was both excited (to know he had made it this far) and agitated because I had missed him. He would have been the only person I've passed three times (February 23rd in TN when he was on a weekend training hike, March 15th in NC as he was heading north, having now started his thru-hike, and today). ‘Salty’ figures he would stay at the Mt. Algo Shelter tonight – and that’s already beyond the entire section I would hike tomorrow. Salty also had met ‘Patches’ and had heard of or met several other thru-hikers that I know. He’s a nice kid – pretty young – and it’s likely we’ll meet again tomorrow, since he’s taking a short day to give his feet a break – they were getting sore from hiking in wet socks for several days. Beyond Wiley Shelter, once up on the high ground, the trail drops right back down to cross Leather Hill Road, then climbs right back up to the high ground and meanders with small ups and downs, and always on easy trail with few rocks, for the nearly two miles to my turn-around at the Yellow Trail intersection (that seems to be the actual name of this trail). The trip out took about two hours and the return trip took less time. I was back at my parking lot at 4:30 and still feeling pretty energetic. I reloaded supplies and studied maps a bit then headed out for one final short leg of hiking. I hiked north across CT 55. I should pause and mention that somewhere around the Yellow Trail I had passed my half-way point, having hiked the equivalent of the entire length of the AT. And now, as I hiked from the parking lot at Hoyt Road to CT 55 I crossed the state line and entered Connecticut for the first time. The short section between these two roads is uneven, going over a little rocky ridge and through some swampy stuff and even some fields, all in a quarter mile. After crossing CT 55 there’s a short level section in the woods and then the trail makes the steady but easy climb to the summit of Tenmile Hill. There is a vista marked on the map at that summit. It’s actually a tiny gap between some trees – what I call a ‘slot view’ from a rocky point a few feet off the trail. That was my turn-around point for the day. I headed back and was finished for the day by just after 6PM. Missing 'Meats' and walking the tall wet grass were the big downers of the day. On the up side, of course, were the two milestones - my personal half-way point and the first contact with Connecticut. The weather was great - it never got hot because a northeast maritime breeze kept clouds overhead. It was in the 60's basically all day - perfect for hiking once the grass dried out. Can I order a few more days like this?